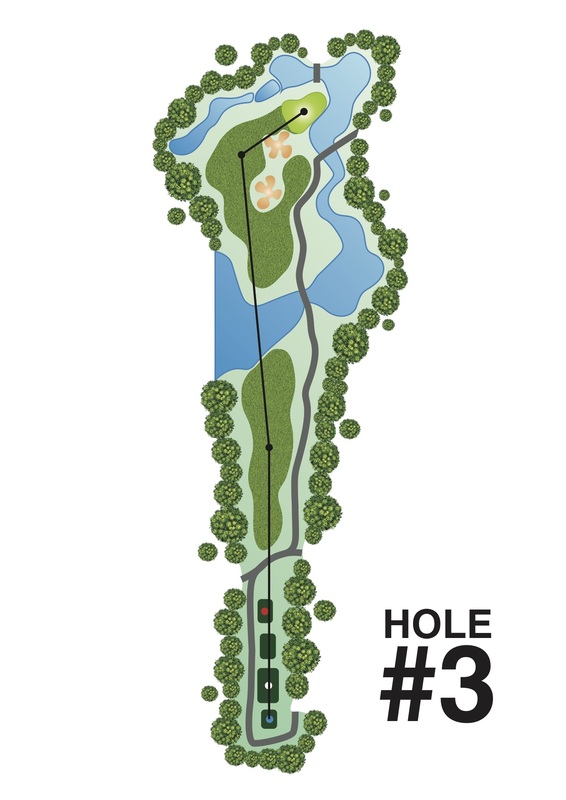 This is a classic risk and reward short par 5 hole. Following a good drive to the fairway, particularly the right hand side, the option of attempting to reach the green in two is presented. The long iron or fairway wood shot must be very precise in length and direction otherwise the ball will finish in water to right and rear or in the guarding bunkers to the left of this line of approach. For the second shot, the other two options are to lay-up to the very wide section of fairway short of the bunkers or play a long iron or rescue club to the wide section of fairway to the left of the guarding bunkers. The former option takes the bunkers out of play on the second shot and the approach shot from here is preferable if the flag is located front right on the green. The latter option offers a shorter approach and is preferable for front left and rear pins. Conversely it is very difficult to approach the right front pin from here due to the proximity of the bunker and the away slope of the green there.